September & October page from the Naruto Shippuuden 2009 A calendar featuring Itachi and Deidara. 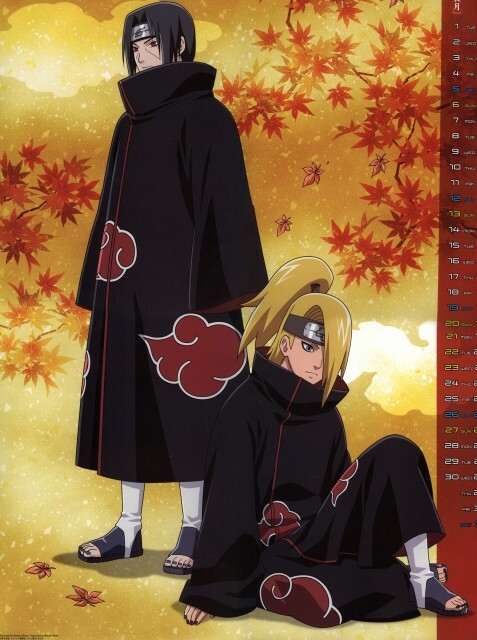 Deidara and Itashi are so stylish! Thanks for the share! Thanks so much for this scan it's exactly what I was looking for! Itachi and Deidara, a great duo. look like they are just relaxing. good scan. Nice, nice. Probably the only picture where you'll see them getting along. excelente imagen,,, sigan subiendo mas...! Oooo, a really nice one, Itachi looks nice.